This is how our fireplace used to look. Not terrible. But it could be better. First, there was that giant stone hearth with the awkwardly cut wood floor around it. That had to be the first thing to go. One day we randomly started prying up the back end of it, just out of curiosity, to see if it would move. To our surprise, it did. The next thing we knew we were carrying a 300 lb slab of polished concrete out the door before our kids could wake up and find a way to get themselves smashed under it. Okay, I don’t know how heavy it really was. But I’m feeling like that was a good guess. It was heavy. We assumed that the stone was original to the house, which would put it at 59 years old. It turns out that what lurked beneath was this, ahem, amazing green tile. Now THAT was original. Here things went on hold for a bit while we had the materials tested for asbestos. The floors in this house did contain asbestos when it was originally remodeled, so we had some reason for concern. Fortunately the tests came back clean, and we got to play with a range of options from there. We discussed about 48 different ideas, and ultimately pried up all of the tile. We then scraped it level, with a little extra help. Next we sealed this layer with a good primer before pouring leveling cement. We scored a lovely piece of quartz for the new hearth for only $150, including fabrication. You can get a good deal on stone if you purchase a fragment. The place we purchased it from cut our original piece a 1/2 inch too narrow, which, unfortunately, would not work for us. They were very sweet about the mistake and allowed us to choose another for the same price. We did not want to take advantage of the situation, but as they were out of 2mm fragments we ended up choosing a thicker 3mm piece for the same amount. Originally we considered placing the stone down in level with the wood flooring, but that plan was fraught with too many difficulties. Do you see it? Keep looking. Once you do you will not be able to unsee it. Actually, I don’t know that I can even blame this on the whole moving thing, but whatever. The flooring on either side of the fireplace slopes down slightly. Annnnd I’m fairly certain no one ever saw this. But I did. 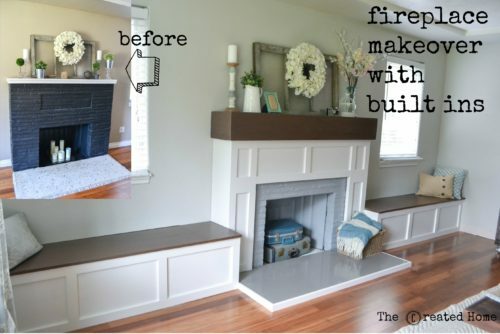 So I created a plan that refaced the fireplace, but also added window benches that would hide the slope. This was the original SketchUp plan for the fireplace, and surprisingly, we followed it pretty faithfully. Using SketchUp allowed us to determine the measurements for the trim boxes and other areas, tasks that would have taken a huge effort to figure out without that program. The wall to the right of the fireplace is slightly shorter than the wall to the left. With the measurements determined via SketchUp I was able to mark out lines and place the trim in no time at all. But first, we needed to reface the brick. We wanted to leave some brick showing around the box, but cover the rest. The brick was too uneven to apply material, so we created a box that slipped over the front and wrapped around the sides. We built this box out of high grade hardwood plywood and simply bracketed it together. With the box in place we started framing out the benches. This step took longer than it would have had we not been dealing with the slope in the floor. We wanted everything to come out perfectly level, and so some pieces had to be shortened ever so slightly. I mention this only because it’s not a perfect world, and if you run into problems like this it is good to know you are not alone. It is worth it to take the extra time to get it right. We faced the benches with luan. Our benches are not large. We had to work with the space we had, so they are only about 16 inches deep, but they provide a surprising amount of storage inside. Next we topped the benches with 3/4 thick pine stained in Minwax Special Walnut. We also started trimming out the fireplace with MDF. In the meantime I was working on crafting the mantle from thick reclaimed wood boards purchased from a local architectural salvage store. The mantle is formed out of two 2 inch thick pieces that I fit together with 45 degree cuts on the sides and a simple 90 degree at the top. I’ll show that a bit closer in a bit. I used authentic reclaimed wood because I just don’t think you can match the character it provides. Here is the front piece being prepped with some light sanding. This is my favorite part – when you get to know each piece and bring out its details. We work with reclaimed wood quite a bit, and pretty well never stain it since it is lovely on its own, but in this case we wanted to match the bench tops, so it also got a layer of Special Walnut. We then fitted the mantle on top and secured it down. It is heavy, and awesome. It is hands down my favorite part of this entire thing. After all the mdf trim was in place it was on to the tedious work of sanding, filling, sanding, smoothing, and trying to make it look perfect. My tip here is to finish off the seams with joint compound, aka mud. It is super smooth and blends really well. Then it was time for another favorite part. Painting. We used a semi gloss paint that matched the trim in the rest of the house. And that’s it! We are really happy with how it came out. It looks like it was meant to be there. Functionally, it adds a ton of seating to the room, as well as storage. It eliminates the awkward empty space at that end of the room and provides a commanding focal point. I’m not going to lie, I sometimes stop just to gaze at it because it makes me so happy. Eventually we plan to trim out the windows, which will add even more character to the room. Our total cost for the fireplace, benches, and quartz hearth came to about $400. I don’t know what this would have cost us had we hired a carpenter, but I know it would have been A LOT more than that. If you are thinking about giving your fireplace a face lift I would say go for it. It’s a whole lot of bang for your buck, and a terrific way to add a ton of character to your home! Thanks for reading, and let me know what you think! The windows are finished and, boy, do they look perfect with the rest of the craftsman design!